We are among the prominent player in the industry offering Enclosed Dust Tight Permanent Magnetic Drum Separator Machine. These can effectively purify the subjected material from tramp iron and other ferrous substances, whatever form the material is in. they do not consume power and hence involve zero operational cost. 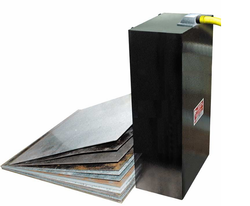 With an everlasting magnetic power, these have been designed to provide long term service. We make these available at market leading prices. 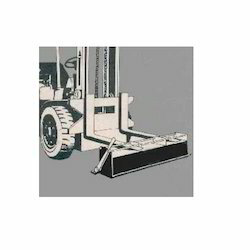 We are among the leading names in the industry offering Forklift Road Sweepers. These can be attached to a vehicle or specifically forklift trucks for the purpose of cleaning outdoor areas from hazardous tramp iron. They are characterized by sturdy construction and light weight and have a long functional life. 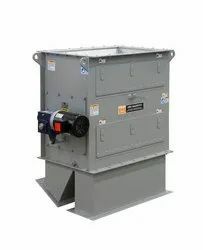 Their widths can vary depending upon the specifications of the customers. Their magnetic force is very powerful and does not fade away with the passage of time. The bunch of magnetic cartridges is placed in the housing which will have inlet and outlet to pass liquid in line system.During the passing of the liquid through magnetic cartridge will attract iron particles and available liquid.It will be cleaned by opening top enveloping fixed with help of wing nut arrangement. 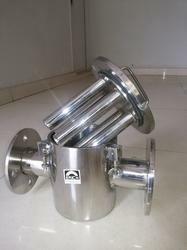 Available standard sizes for Pipeline 2 inch to 18 inch.